The Moto Plate Bumper is the best of both worlds. It is part skid plate and part front bumper. The Moto Plate bumper is perfect for woods riding and harsh conditions. 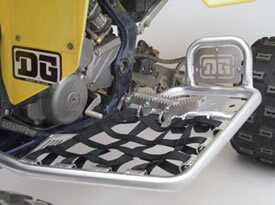 DG's GNCC Grab Bar incorporates larger grab points, making it easier to pull your quad out of the mud. 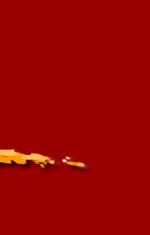 Mounts in minutes and offers mounts for the brake light or a number plate. 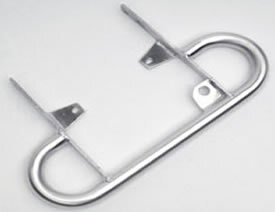 With a stainless steel replaceable foot peg and stylish inbuilt heel guard this nerf bar is as beautiful as it is well made. Help keep dirt and mud off your engine. 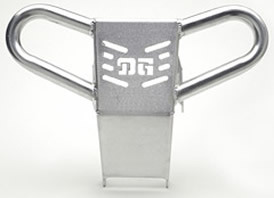 DG Alloy Front Fame Guards will protect the front of your pipe and motor from flying debris. 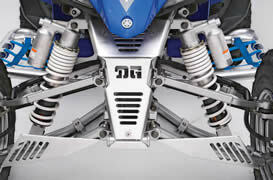 Allows greater air flow to keep the engine temperature down. A perfect choice with the DG Alloy Front Bumper.